Also serving communities of West Olive, West Olive. There are 69 Assisted Living Facilities in the Holland area, with 6 in Holland and 63 nearby. The average cost of assisted living in Holland is $3,906 per month. This is higher than the national median of $3,346. Cheaper nearby regions include Zeeland with an average starting cost of $3,000. To help you with your search, browse the 261 reviews below for assisted living facilities in Holland. On average, consumers rate assisted living in Holland 4.3 out of 5 stars. Better rated regions include Zeeland with an average rating of 5.0 out of 5 stars. Caring.com has helped thousands of families find high-quality senior care. To speak with one of our Family Advisors about assisted living options and costs in Holland, call (855) 863-8283. The city of Holland, Michigan celebrates it's Dutch heritage all year long. Seniors can tour the DeZwaan Windmill, learn how to Klompen dance at Nelis' Dutch Village, stroll near the tulips at Veldheer Tulip Farm, and admire the Dutch art collection at the Holland Museum. Seniors looking for assisted living accommodations in Holland, Michigan are likely to find one that suits them with 64 assisted living facilities located in and around Holland from which to choose. The Michigan Bureau of Child and Adult Licensing licenses and regulates all of the facilities in Holland and elsewhere in the state. Located in west-central Michigan along the Macatawa River, Holland is known for its mild summers and cold, snowy winters. The average high temperature in January is 33 degrees Fahrenheit and 83 degrees Fahrenheit in July. Extreme temperatures can be a problem for AL residents sensitive to weather changes. Senior Resources of Western Michigan provides a number of services for Holland residents aged 60 and older, including meals, exercise programs and wellness workshops. There is also a senior center in Holland. Crime is not quite the problem in Holland as it is in many other parts of Michigan. The overall crime rate in Holland has decreased slightly in recent years and is just one percent higher than the national average, so seniors can breathe a little easier on day trips. The Holland, Michigan area is home to world-class medical facilities including Holland Hospital, in the event of medical emergencies or illness. It's not difficult to travel around Holland. Macatawa Area Express provides on-demand public bus transportation throughout Holland and the adjoining area. In addition, the Michigan Smart Bus system offers curb-to-curb service to points within 10 miles (with advanced reservations), making it an ideal option for Holland seniors who can't walk far. Holland is well-known for its annual spring tulip festival. In addition, the city is home to the Cappon House Museum, the Holland Museum and Velheer Tulip Gardens. Most Holland events and attractions offer a senior discount, although the qualifying age varies. There's also an active senior center. Assisted Living costs in Holland start around $4,208 per month on average, while the nationwide average cost of assisted living is $4,000 per month, according to the latest figures from Genworth’s Cost of Care Survey. It’s important to note that assisted living rates in Holland and the surrounding suburbs can vary widely based on factors such as location, the level of care needed, apartment size and the types of amenities offered at each community. 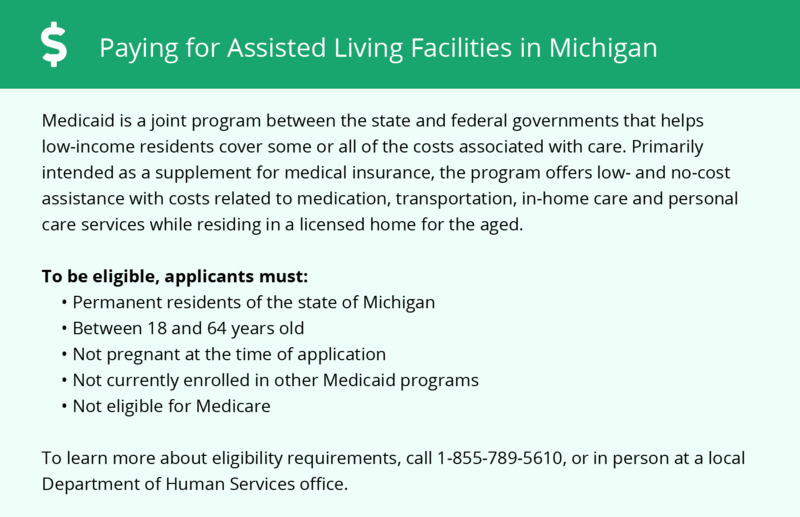 There are a number of state and federal government programs that offer financial assistance to eligible Holland, Michigan seniors living in an assisted living facility. 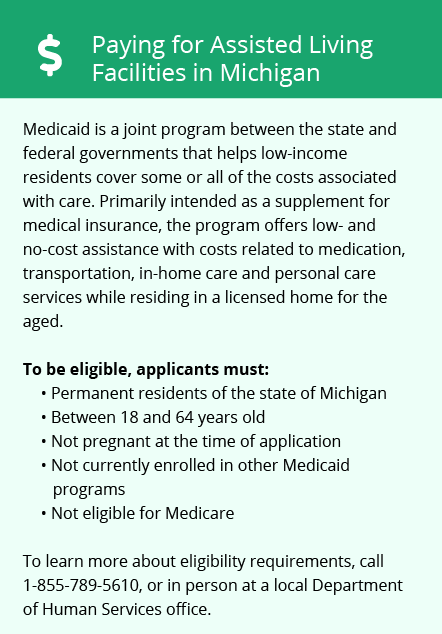 These include Medicaid State Plan , MI Choice and Supplemental Security Income Category G.
Holland and the surrounding area are home to numerous government agencies and non-profit organizations offering help for seniors searching for or currently residing in an assisted living community. These organizations can also provide assistance in a number of other eldercare services such as geriatric care management, elder law advice, estate planning, finding home care and health and wellness programs. To see a list of free assisted living resources in Holland, please visit our Assisted Living in Michigan page. Holland-area assisted living communities must adhere to the comprehensive set of state laws and regulations that all assisted living communities in Michigan are required to follow. Visit our Assisted Living in Michigan page for more information about these laws.